Jávea, or Xàbia in the Valencian language is located on the Costa Blanca, in the Comunidad Valenciana and the province Alicante. Located 96 km from the airport of Alicante and 120 km from Valencia airport. It's known for it's beaches and beautiful bays and the Montgo mountain of course, which can be seen from many different places in the town. Jávea is a stretched out area between two capes, Cabo San Antonio and Cabo La Nao and has an surface of 68.59 km2. It consists of three parts: the old town, the port and the Arenal and has 27.681 inhabitants (2015), of which 53.1% of foreign nationality. This population doubles however and in the summer it multiplies itself even to more or less 150.000 due to the number of tourists, the main economic sector nowadays. Did you know there live 85 different nationalities in Jávea? 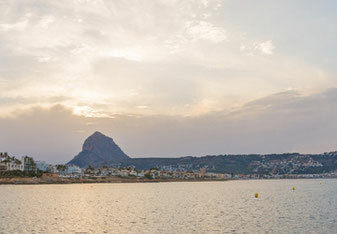 More fun facts and information about Javea here.